This metal and fabric sample pack gives you an idea of the metal and fabric colours of our furniture, cushions and parasols. So if you're a bit stuck deciding which colour scheme you'd like best for your new garden furniture, just add this set of sample fabrics to your basket. It's completely free of charge. This pack combines our fabric samples in four colours with a metal swatch in Antique Bronze. The sample packs are put together by hand, and will arrive in a roughly A5-sized envelope. If you have a particular product in mind, clicking on any of the photos on its product page will bring up the gallery. 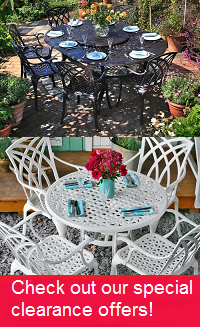 Often we have a photograph of our tables and chairs accessorised with cushions and/or a parasol in at least one colour. We've received plenty of photographs from our customers too, and have collected them into a customer photo gallery. These can give you an impression of the wonderful colour combinations possible when you pair our accessories with one of our furniture sets. Can't decide between Stone, Green, Terracotta and Blue? Would you like a better look at the colour Antique Bronze, by holding a physical sample in your hand? Order a free sample pack today to help you find the ideal colour scheme for your new garden furniture.